When adorning couple watches, you and your significant other want to show your oneness. Also, you still want to express your sense of fashion. The timepieces will be similar but each will be symbolic with the gender. Usually, men’s watches are larger, 40mm plus while female watches are smaller. The following are some options to watch out for. One thing that stands out in this watch set is heart design. It brings out a romantic appeal that makes it a good pick for valentines, anniversary, birthdays and other occasions. 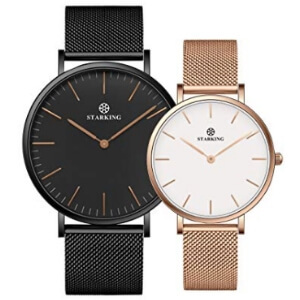 We love the sleek finish on both watches which give it a chic look. The two pieces are relatively lightweight and feel just right on the hands. They both feature flexible bands which also have a smooth finish. They are also lightweight and are harnessed on the hand without digging into the skin. The stainless steel material should keep its elegance and smoothness for a long time. And as you know, stainless steel doesn’t corrode, rust, or get stained easily. You and your loved one should be able to adorn this watch for years to come. 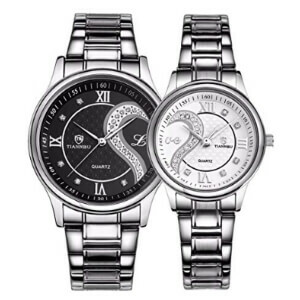 You and your soul mate will find these watches a good expression for your relationship. They look similar with the exception of the man’s watches being larger while the lady’s one is smaller. The elegance and sophistication are quite obvious and many people should find them worthwhile. This aspect is enhanced by the ultrathin stainless steel case and the lightweight and flexible leather straps. They both feel smooth to the skin and aren’t heavy. Wearing them for a long time shouldn’t be a challenge. They run seamlessly and are precise courtesy of the Japanese quartz movement. And to enhance she sophist iced look, they have brown leather straps which merge nicely with the polished steel case. These watches do bring out the coupling effect. “His” watch is larger and bolder due to the large black dial. “Her” watch looks more chic courtesy of the white dial and is also smaller. 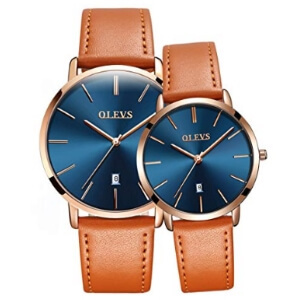 We love the graceful effect of these two timepieces which make them good daily wear pieces. They are lightweight and feature a smooth texture. You are therefore likely to experience any roughness, irritation, or abrasion. They should handle the bangs, falls, chips, vibrations and knocks well courtesy of the stainless steel case and the Hardlex dial window. They don’t scratch, rust, fade or lose their elegance easily. Couples always want their relationship to last for a lifetime. With this in mind, it makes sense to only go for high-quality timepieces. They should be made of tough materials such as stainless steel or sapphire crystal. The engineering should also be good to allow them put-up with regular wear, falls, and bangs, vibration, shocks, and more. Pieces such as the ones featured above score highly in regards to reliability and longevity. Under good care, they will last for a long time. Top choices will look very fashionable. They will feature a highly polished finish, shiny and reflective finish, sophisticated dials, and nice color matching. Also, they may have some sparkly dial, romantic prints such as hearts, and other things that bring out romance or life partnership. The whole idea is to make the couple wearing them standout. You see one and you see the other. Some prefer a classic or traditional look while others opt for modern and trendy looks. The choice is up to the wearers to decide. When you look at a watch. You should easily tell the two wearing them are an item. Picture two people wearing t-shirts. The guy wearing the one written hers while the lady adorns one printed his. The same effect should be clear in the watches. As you’ll see in the above products, they look exactly similar in all aspects. The design, layout, color, movement, and more. The only exception is that the man’s watch is larger while the woman’s piece is smaller. Also, the colors in a man’s piece may be bolder while ten the lady’s piece is more vibrant and chic. You don’t expect a man to wear a pink watch, do you? Also, a woman won’t look very nice in a pure black watch.